Aside from a passport, a camera, and a sense of adventure, what’s the most important thing that a traveler should own? Everyone would agree that it’s a compact and durable luggage that’s easy to carry and has a lot of compartments for clothes, gadgets, and other traveling necessities. You want a luggage that is dependable for all the trips you’ll be taking in the coming years. In this review, we’ll be looking at the Tortuga Homebase Duffel Case, a super light carry-on bag that every wanderlust-at-heart would love. The Tortuga Homebase Duffle Case is a hybrid between a duffel bag and a suitcase—it combines the portability of the former and the spaciousness of the latter. It also eliminates the downside of these two types of luggage: the inefficient dimensions of a duffle bag and the heaviness of a suitcase. Its smart design and light materials maximize the amount of stuff you can put in it. For people who like to travel but want to avoid additional luggage costs at check-in, the Tortuga Homebase Duffle Case is perfect for you. You can purchase it alone or with the Nomad Bundle, where you will also get the Tortuga Homebase Backpack at a discounted price. If you travel a lot, you’d know that durability is important when it comes to your luggage. You want something that you can take on-the-go yet will last and remain intact after so many trips. The Tortuga Homebase Duffle Bag uses materials that will keep it strong wherever you go and no matter how often you travel. It is made of LS21 waterproof sailcloth, Ariaprene foam, YKK zippers, and duraflex buckles. LS21 Waterproof Sailcloth: What’s a sailcloth? You might be wondering. Well, it’s exactly how it sounds. Its LiteSkin waterproof sailcloth is a high-performance material used in sails which, as you may already know, are always exposed to natural elements yet can withstand heavy winds and rains at sea. It’s true that using a sailcloth to make a bag doesn’t sound conventional, but the brand doesn’t care about convention. It prioritizes quality over norm, which ensures that you will be able to use your bag for years to come. 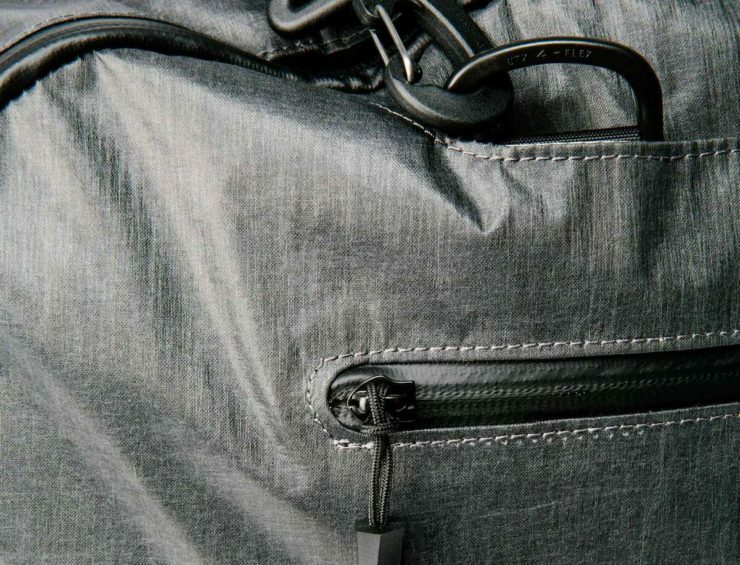 Don’t get fooled by how thin the material feels either—it is light and almost paper-thin, but the extremely tight weave of the sailcloth makes it more durable than traditional bag materials. Waterproofness, durability, abrasion resistance, and fray prevention—all of these are features of the Tortuga Homebase Duffle because of the sailcloth material that the brand uses in manufacturing this product. Ariaprene Foam: Ariaprene’s foam-core technology makes it light yet flexible, supporting movement, stretch and compression—things that everyone’s luggage experiences during travel. Ariaprene foam is used in a lot of gears and apparel, such as New Balance shoes and, of course, the Tortuga Homebase Duffle. Aside from performance, the material also takes pride in being environmentally friendly and hypo-allergenic. It also pairs well with the LS21 waterproof sailcloth because it dries quickly. YKK Zippers: YKK is a Japanese brand of zippers that designers all over the world love to use. It’s safe to say that the company has perfected the craft of making zippers after decades in the business, which is how it became an established brand in the apparel industry. Duraflex Buckles: The problem with most duffle bags is that their buckles break after several uses or so. With the Tortuga Homebase Duffle Bag’s duraflex buckles, you don’t have to worry about this problem. The buckles withstand force, so you can carry it without any anxiety. The Tortuga Homebase Duffle Case measures 22 inches long, 14 inches wide and 9 inches deep, and it only weighs 1.9 pounds. Again, it is compact and light, which are characteristics of a great carry-on bag. 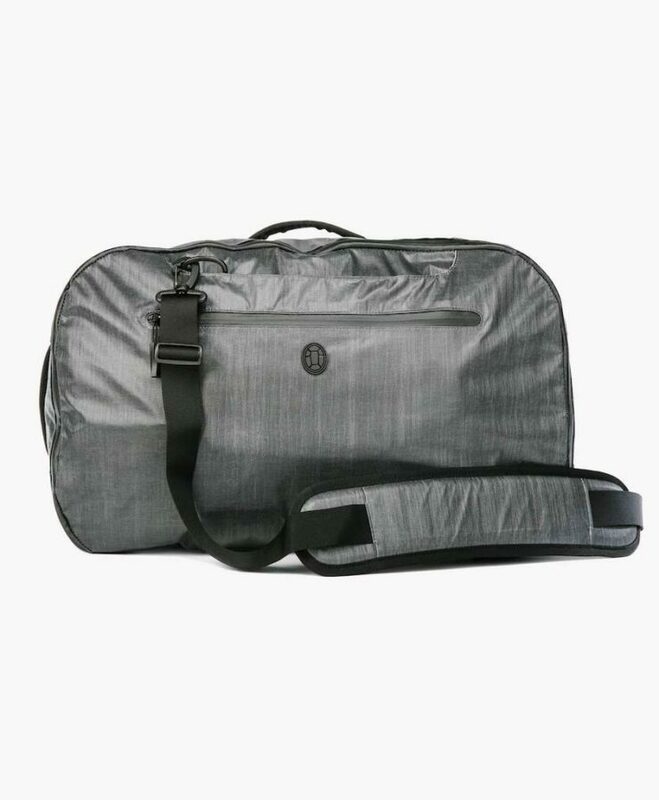 The Tortuga Homebase Duffle Case comes in a sleek gray color. It has side, bottom and top handles, so you can carry it whichever way you want. It also comes with two hand straps and a detachable shoulder strap, which gives you more flexibility when you’re walking around with the bag. It has an external pocket on the front of the bag where you can put your passport, visa, and other important documents and belongings that you may need easy access to. The bag has a simple design, with the logo of the brand stitched on the front pocket. The main compartment of the Tortuga Homebase Duffle Case is very spacious, so you can easily store your clothes, gadgets, shoes and other belongings in it. 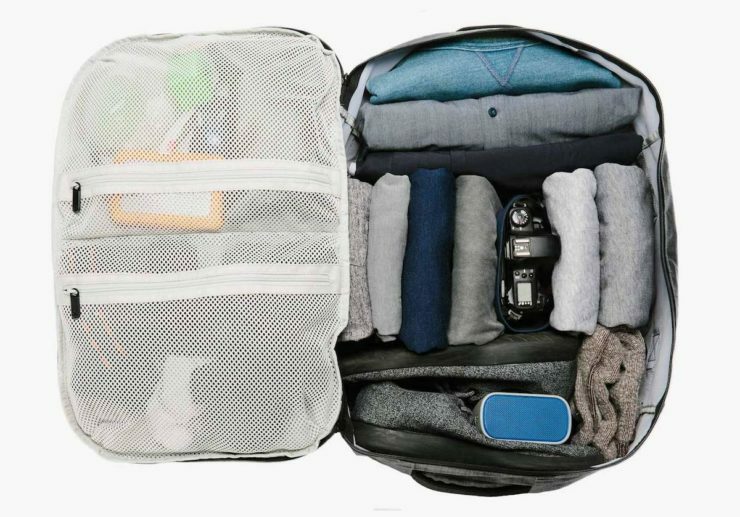 Inside, you will also find two mesh compartments where you can organize your toiletries and makeup, small tech and equipment such as chargers, adapters and batteries, socks and underwear, and other traveling necessities. The simple internal design of the bag allows you to customize your packing as you much as you wish. 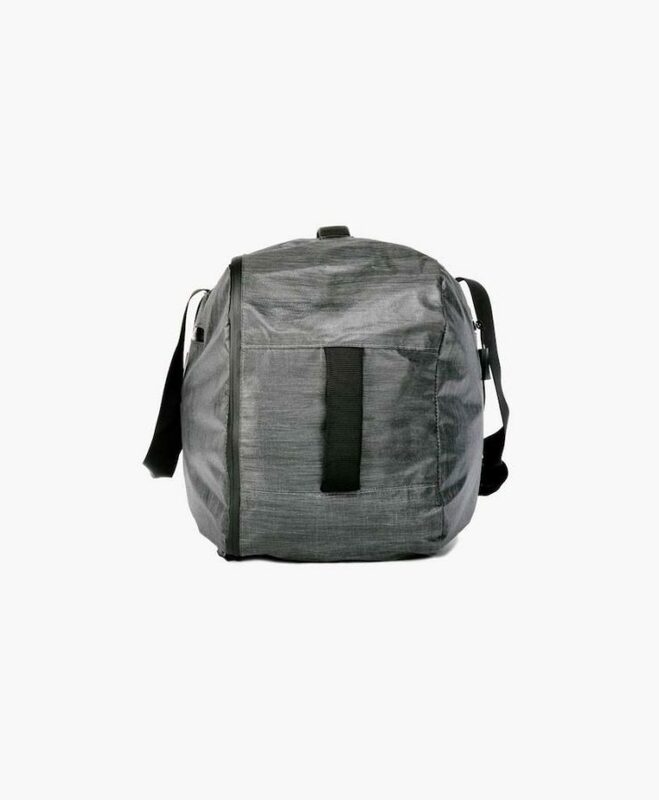 With how spacious the bag is, you can even fit a spare backpack inside it with all your things that you can carry with you during your side trips. A backpack within a duffel bag? This takes “carry-on” to a whole other level. Getting excited to pack for your next big adventure? Hold up one sec. To maximize what you can do with your Tortuga Homebase Duffle Case, continue reading below for organization tips and tricks. Experienced travelers know the importance of staying organized when traveling. However, they will also know that organization is always easier said than done. Even with a light and compact luggage like the Tortuga Homebase Duffle Case, packing can still get messy if you don’t know what you’re doing. 1. Know your airline’s baggage policies. The first step to organized packing is knowing what your airline’s policies are when it comes to carry-ons and other luggage. What’s the weight limit? What things are not allowed in the plane? What things are allowed in carry-ons? Make sure that you do your research prior to your trip, especially if you are using an airline that you haven’t used before or are flying for the very first time. This will prevent any delays and problems during check-in. 2. Make a list of everything you need. Before opening your luggage and going through your closet, sit down, think about your destination and create a list of all the things that you will need during the trip. Is it cold or hot where you’re going? Do you need light layers and swimsuits or thick layers and warm coats? Do you need flip flops or boots? Will you be going on a fancy dinner? Maybe you’re going somewhere more outdoorsy and casual. By keeping your destination and itinerary in mind, you’ll be able to pack the appropriate clothes for your trip. Aside from taking note of your clothing items, you should also make a list of all the tech and equipment that you wish to bring. Some examples of gadgets that people take with them during their trips include but are not limited to: a smartphone, a laptop, a tablet, a Kindle, chargers for all of your gadgets, a pocket charger, international adapters, a DSLR camera, a smaller digital camera, a GoPro, a Polaroid camera, earphones, batteries, spare memory cards, a selfie stick or a small tripod, a portable WiFi device, etcetera. Lastly, make a list of all the miscellaneous things that you need to take with you. These include toiletries (especially if you’re not staying at a hotel where these things are provided), makeup, a book or two, sunscreen (for warm destinations), etcetera. When creating your list, try to be as specific as possible so you won’t forget to bring anything. For example, you might write “toiletries” and then forget to bring your toothbrush. Also, keep this list with you when you travel, whether you make a written copy or keep one in your phone. This will help you keep track of all of your belongings when you’re packing up before going home. Overpacking is a common problem for travelers. Sometimes, you try to pack outfit options so you can take cute photos for your Instagram. However, when you’re trying to limit your baggage weight, this can be a huge problem. To avoid overpacking, plan your outfits beforehand. Keep your itinerary in mind, and then plan each outfit accordingly. A night out, a hiking trip, a beach day—pick the right clothes for each activity. Once you’ve decided on your outfits, take a picture of each on your phone (preferably one where you’re trying it out) so you can go back and look at it during your trip. When your outfits are already planned, there’s no more point in packing options, right? Another way to avoid overpacking is to wash your clothes during your trip. If you’re going on a two-week vacation, you pack clothes for a week, have them washed during the weekend, and then use them again for the week to come. In addition, your gadgets shouldn’t take up much space either. If you’re already bringing your phone and a DSLR camera, maybe you can leave your Polaroid camera at home (or ask a friend to bring theirs instead). Or, if you’re already taking your laptop and phone with you, maybe it’s best not to bring your tablet and Kindle with you anymore. Folding is such a beginner’s mistake. If you’ve been traveling for a while now, you know that it’s better to roll clothes instead of folding them. By rolling, you make each item of clothing more compact so it takes less space. As a result, you can pack more into your luggage. Packing cubes are a new way to make your packing more efficient. With packing cubes, you can compartmentalize your luggage so each “category” is separated into smaller units within your bag. This takes organization into a whole other level. For example, you can put casual shirts, pants and shorts, dresses, socks and underwear, swimsuits, etcetera into separate packing cubes. At the same time, you can put one outfit together into a packing cube so you only have to access one per day. These packing cubes will also help you separate clean from dirty clothes if you’re the kind of traveler who lives out of your luggage. Just like the Tortuga Homebase Duffle Case and Backpack, their Outbreaker Packing Cubes are made from durable sailcloth and are designed to fit perfectly within the brand’s bigger pieces of luggage. They will help you stay organized before, during and after your trip, and you will be able to use them for years to come. 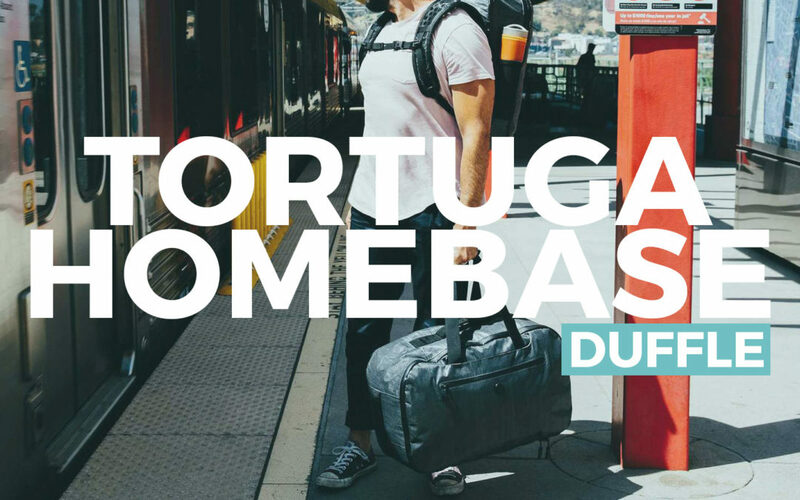 If you’re looking for a luggage that you can carry with you all across the globe, the Tortuga Homebase Duffle Case is the perfect choice for you. It is made with durable materials that resist wear and tear and last longer than conventional materials that most other luggage brands use. The sleek and simple design of the bag gives you a lot of options when it comes to customizing your packing. When paired with the Outbreaker Packing Cubes, you can stay organized all throughout your trip. 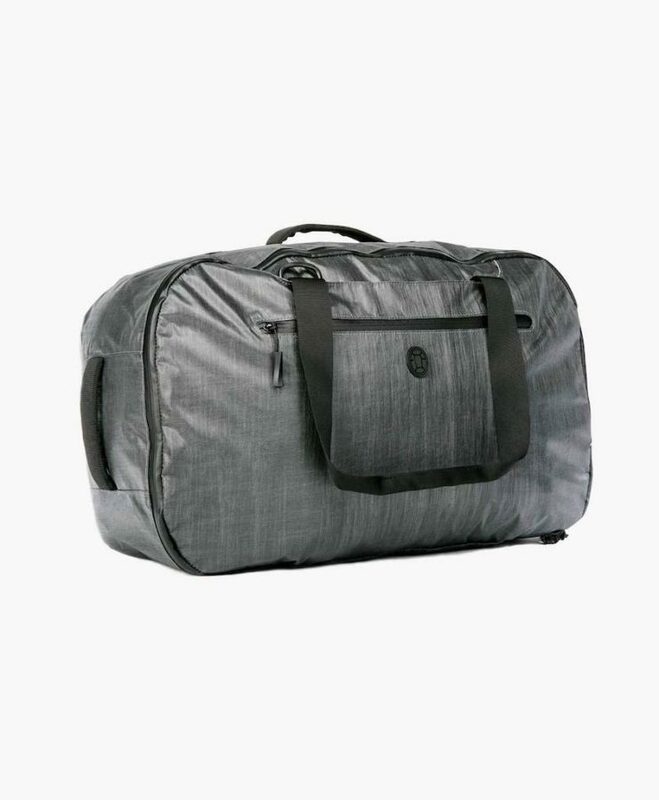 Overall, the Tortuga Homebase Duffle Case is a great investment for those who love to travel. Light, perfect and durable for any type of trip—get your Tortuga Homebase Duffle Case today.